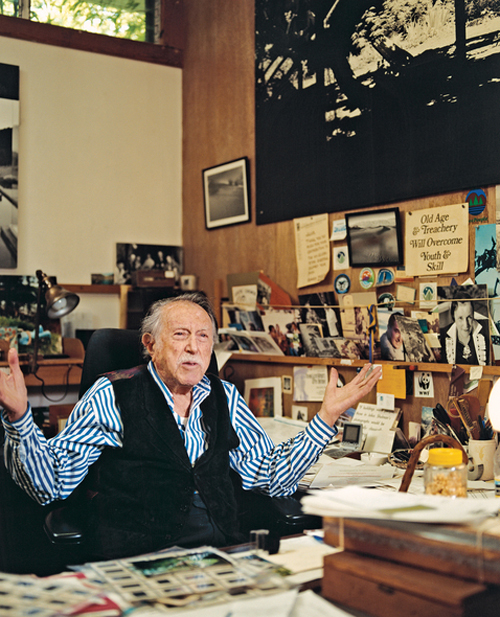 Julius Shulman, photo by Catherine Ledner for Dwell. Upon the death of Julius Shulman, there have been several fine remembrances of his work and its impact, and the imminent release of the amazing documentary Visual Acoustics to DVD takes on a heightened significance. 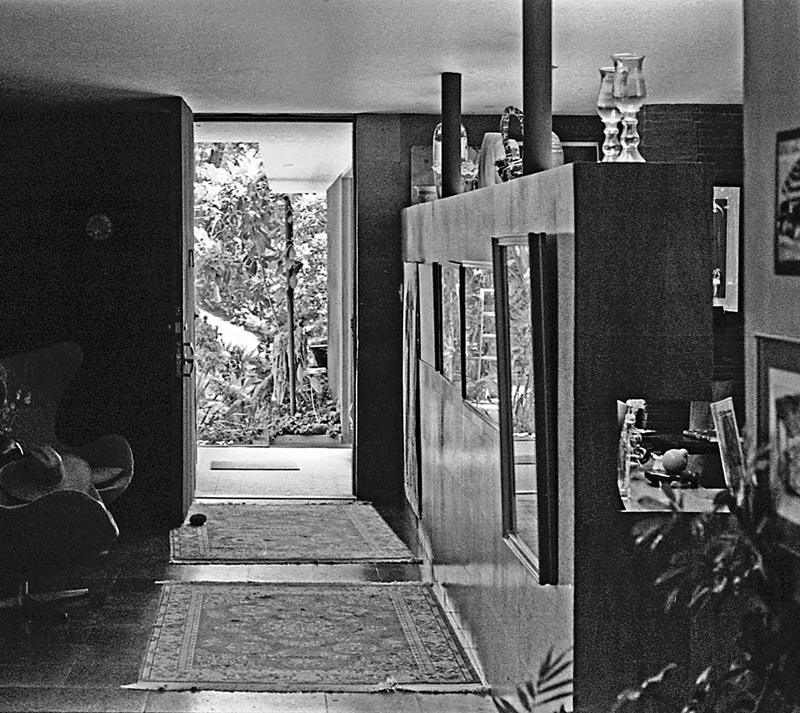 As the media takes notes of his towering artistic contributions, I think about personal gratitude to Julius Shulman for altering the path of my life. Having always loved buildings, I thought that designing them would be the best way to consummate the relationship, so I headed down the Architectural Planning degree path. I liked drafting floor plans and designing spaces, but it was during an Architectural History class assignment to photographically illustrate various types of architecture using local buildings that the light bulb went off: I love interpreting the buildings that other people made. I thought of all the alluring black and white images of mid-century modern architecture that haunted my imagination, and realized those were the true inspirations. 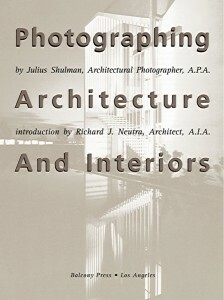 Then I realized that those photographs were all taken by the same man, Julius Shulman! His work was consistently inspiring, so I put the drafting board on ice, pulled the old Minolta X-7A out of storage and changed my major to Photography. 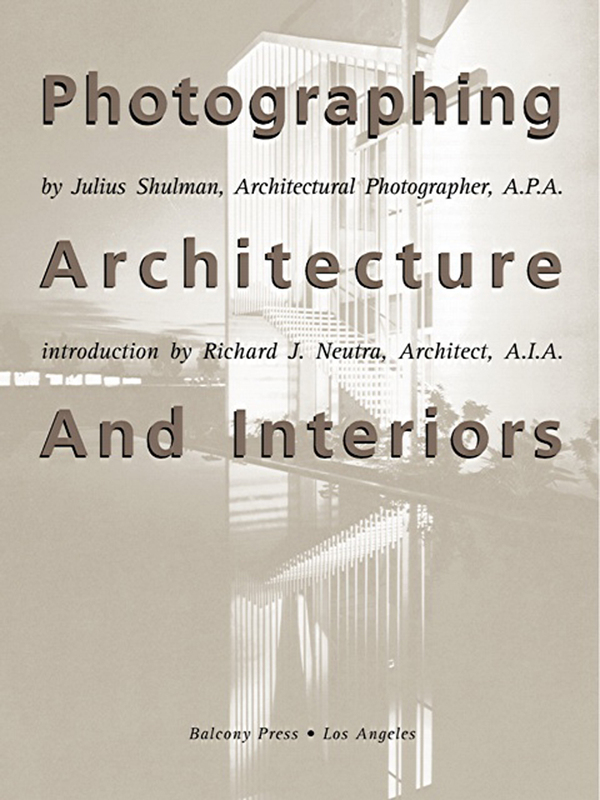 Shortly thereafter, I came across the 2000 re-issue of the 1962 book Photographing Architecture and Interiors by Julius Shulman. Several knowledgeable and passionate teachers taught me the science of the camera and the art of printmaking, but it was Shulman who taught me about composition, and that the dedication of time can bring clarity of vision. People might assume architectural photography is easy because the subject doesn’t move, but as Julius pointed out, “The subject is moving because the earth is rotating, and we must carefully observe the position of the sun.” The best shot of a building requires working with Mother Nature, which requires patience, and sitting under a tree waiting for the perfect moment instilled in me a sense of peace, contentment and the supreme luxury of taking the time. Shulman’s enduring adoration of nature was taught by example, and architectural photography is my form of meditation. 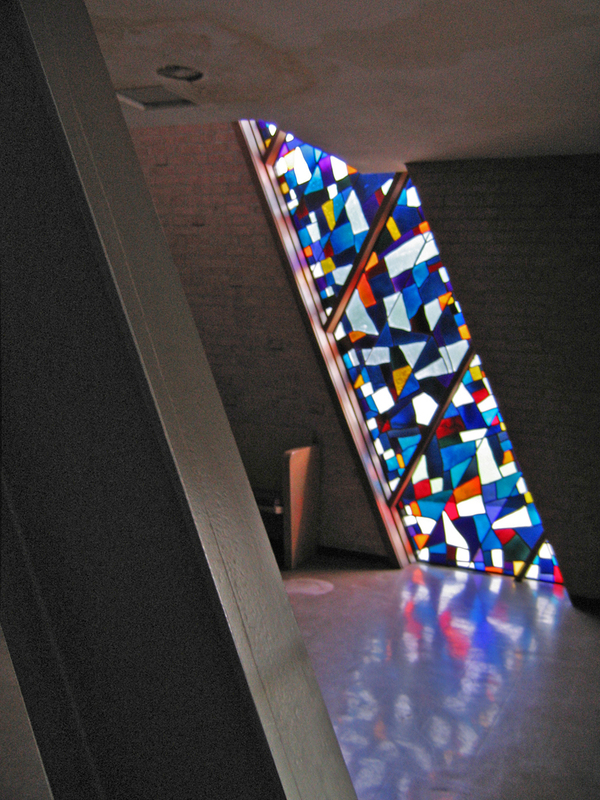 Shulman’s mission was to translate the 3D art of modernist architects into a 2-dimensional format that the layman could understand, admire and desire. As he wrote in his book, “Although architectural photography can be defined as a physical recording of the image of design, the photographer can develop the ability to transcend the mere physical recording. The photograph can then become instrumental in evoking empathy with the design. (It) enhances awareness of an already-familiar environment. It prepares for the actual experience of being at or in a building. It substitutes for the experience until it occurs, if it ever does.” This is the guiding vision and mission of BELT. 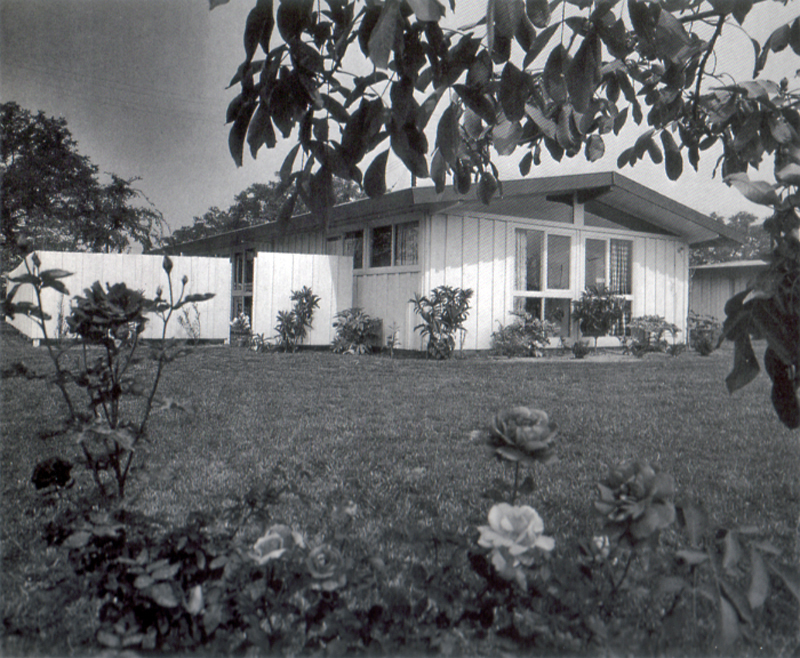 Shulman wanted to convey the personal satisfaction felt by the owners of modern homes he photographed. 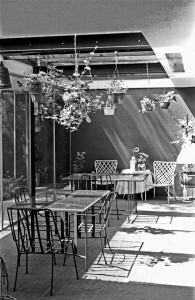 At times, he battled for his photos to show the comfort and pleasure of the designs, rather than the stark aestheticism preferred by some of his architect clients. An architect designs, but we are the ones who live with them every day, and the emotions that a building conjures dictates its legacy, for better or worse. 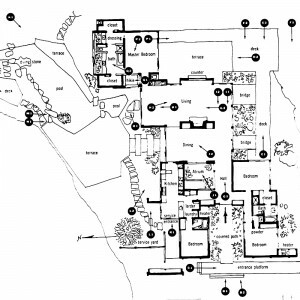 Shulman's map of a photo shoot from his book Photographing Architecture and Interiors. 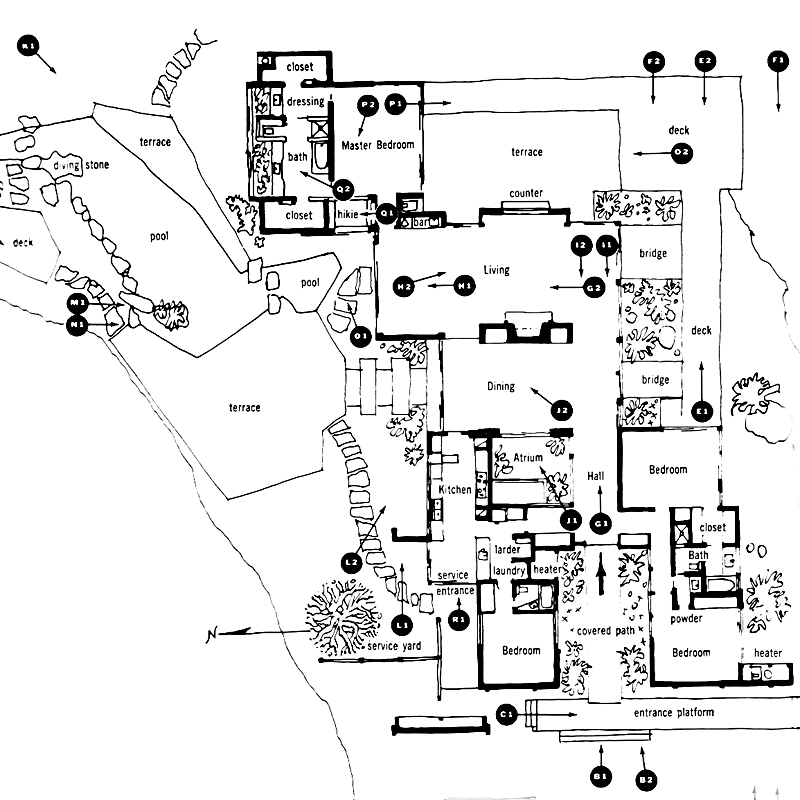 In one remarkable chapter of his book, Shulman shows the interior and exterior plan of a home in Bel Air, California, annotated with the exact location and direction of his camera for the 33 shots he took of it for the July 1961 issue of House & Garden. He then shows you all 33 photos and explains why he composed as he did, and the emphasis is always on making the house understandable to the layman. You get a personal map of the artist visually stalking the project in a vaguely counter-clockwise direction. Sometimes he shoots the same scene from opposite angles, while other times he shoots the same scene from different distances. In a couple of cases, he merely moved the camera a few inches to the left of the previous shot, but there’s a vast difference in the message. Multiple times throughout the book, he shows you his photographs of the same building from the same angle taken with different cameras, lenses, filters and time of day, and he explains the merits of each application and why the shot he ultimately chose was the best representation. In a couple of cases, he even shows you the photo as it was shot compared to the tricks he employed in the darkroom to make it more dramatic. He even illustrates how he employed a “portable garden” or a neighbor’s flower bed to add landscape drama to an otherwise-barren new home. Shulman setting up a shot through his "portable garden." Shulman’s complete honesty about how he achieved such successful results does not reduce the final impact, it merely reveals the generosity of his spirit and his unceasing need to educate and inspire others. A true artist does not need to hide behind illusions of grandeur, because they know that even when giving you the exact recipe, results will vary, and this is the art of beauty and possibility. I am grateful to Shulman for every personal and photographic adventure he’s led me to, and am comforted in knowing his work will continue to inspire so many others, forever and ever. 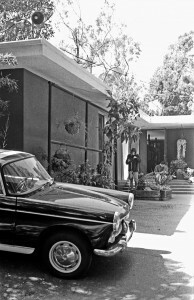 Entrance to Shulman's home. Photo by David Laslie. In the Spring of 1995, I was fresh to Los Angeles and a little more than impressionable. Architect John Lautner had recently died and a tour was organized of some of his iconic homes in the Hollywood Hills. At the end of the tour, there was the opportunity to meet Lautner’s biographer, Frank Escher, and purchase his book. Two lines formed in a parking lot, filing toward two folding tables. I knew the one line was for book purchases; what was the other line for? I looked over at the other table and immediately recognized why the other line was so much longer than the one in which I stood. Sitting at the table was a little old man with the biggest grin on his face, signing autographs, posing for pictures, and of course, telling stories. It was Julius Shulman, and he was having the time of his life. I was excited to buy the Lautner book and go to the end of the other line so I could get it signed by the great master whose photos told the story of John’s genius (his photos composed about 90% of the illustrations in the book). By the time I got to the front of the line they had run out of books, so I was forced to settle for a rain check. I did notice, however, that they were selling little postcards of Shulman images as well, so I bought one of the Malin house, (a.k.a. the “Chemosphere” ) and asked Julius to sign it. He didn’t care if you bought the book vs. the postcard; I think he would have willingly signed on the back of your hand or your shirt tail, given the chance – anything to talk to one more person and to give a little bit more of himself. Julius’ generosity is what I will remember most about him. He would give generously – almost wastefully – of himself, and nothing made him happier than the opportunity to do so. His wife Olga was the same way. Truly, they were one of the happiest couples I’ve ever known, and together the exuded love and generosity. 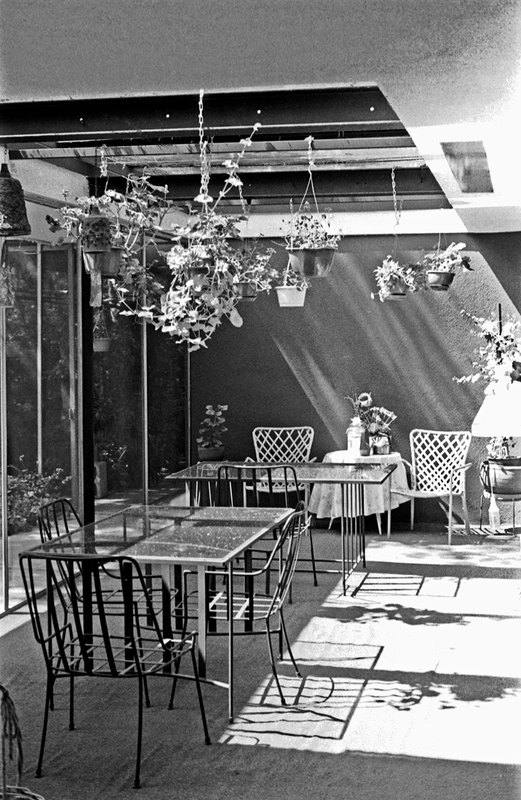 The patio of Shulman's home. Photo by David Laslie. I had the pleasure of witnessing this on several occasions in the Spring of 1998. While studying architecture at the University of Southern California, I had the opportunity to take an elective course in architectural photography taught by none other than Julius Shulman. No one knew exactly how the class would work, as USC had never done anything like it before. As we were participating in something new and different, perhaps even historically significant, I was asked by the dean to drag the school’s video camera to class every time and record each session for posterity. Every Tuesday, we’d drive up the 101 into the Cahuenga pass and negotiate twisted Woodrow Wilson Drive up to Julius’ house. I remember not being impressed by the house, designed by architect Raphael Soriano, and didn’t really buy Soriano’s explanation of how the subtleties in proportioning were meant to remind one of a Bach fugue. When you first approach Julius’ house, it looks like an arrangement of two very plain boxes, but once you cross the threshold, however, you’ve entered Julius’ realm, a place of beauty, comfort, and light. 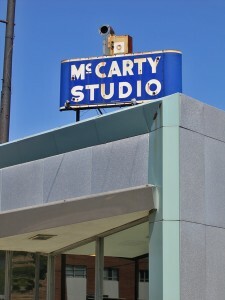 The studio was cluttered with matted photographs, some small as snapshots, others tall as a person. There were no clear surfaces; walking into that studio was like walking into his mind. This man had literally seen it all. The rest of the home was nothing like the studio; it was immaculate. Every object was arranged and ordered, but it was not a modern showcase, though. There were no Barcelona chairs or Eileen Gray end tables. The furniture was not there to reinforce the lines of the architecture, it was there to use. 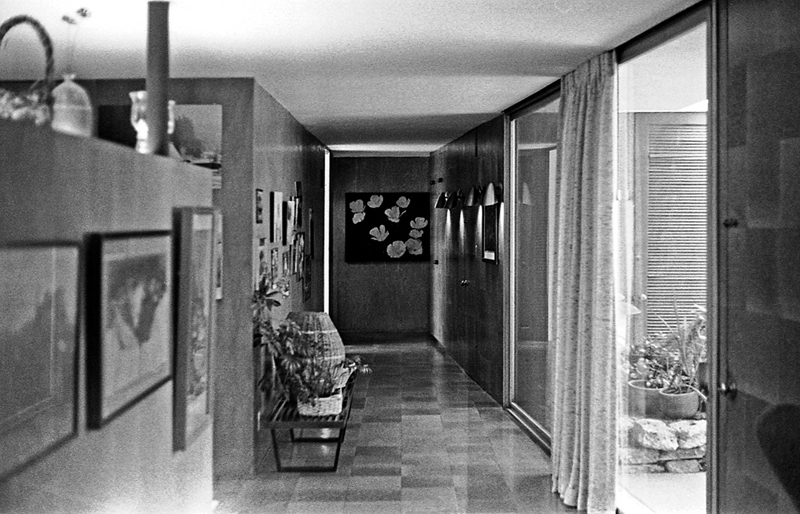 Hallway of Shulman's home. Photo by David Laslie. Julius told us a story about one of the fights he got into with architect Richard Neutra over furniture. 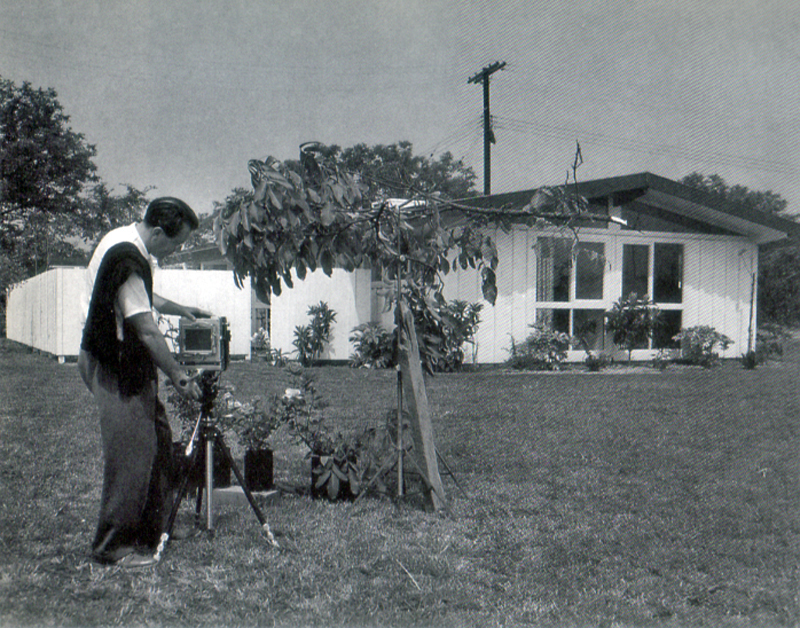 They arrived to photograph a home the architect had just completed, and Neutra was absolutely livid about the furniture the owners brought into the house. He employed Shulman to help him take all of the owners’ furniture out of the house and replace it with modern designer furniture for the purpose of staging perfect photos. They spent quite some time setting the scene and arranging things to Neutra’s satisfaction – simple, sparse, and modern. When Neutra left, Shulman removed all the new furniture from the house and brought all the owners’ furniture back in and arranged it how it had been arranged previously. Then he got his shots. Neutra was supposedly quite pleased with the photos and didn’t realize that the furnishings were not those which he had brought in. 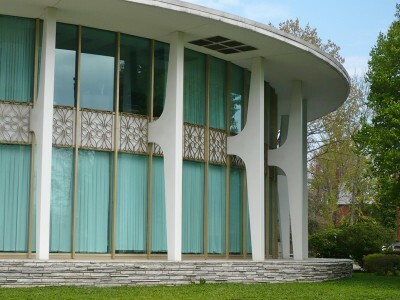 Julius taught us that our environments should be livable, and that this should be our primary concern, above clean lines and fugue-like proportions. His photos exude a richness and fullness of life because that was more important to him than anything. He said Soriano criticized him for having such a messy studio, and having such pedestrian furniture in his house, and for growing a jungle so thick it obscured the house. But Julius pointed out that whatever you do, it should support quality of life. If you are going to plant a garden, make it a jungle. If you are going to furnish a home, make it comfortable. If you are going to take a picture, make it alive. View to the front door of Shulman's home. Photo by David Laslie. I think this desire for quality of life provided him with the perfect foundation upon which to build a generosity of spirit. Because he made the effort, he was blessed with richness and fullness in abundance. He was generous with himself, was rewarded by the fruits of that generosity, and was then able to give generously of himself to the world at large. We can all learn a lot from this man’s work, but we can learn a lot more from his life. He used to say that taking a great picture is not about what kind of camera you use, or what kind of film you use, or what kind of filter you use, but is instead about how you see and compose the shot. Similarly, life is not about the lines, or the proportions, or the furniture. Life is about how you live it. And did he ever live it. Today is when the Preservation Board reviews the proposal to demolish the San Luis. 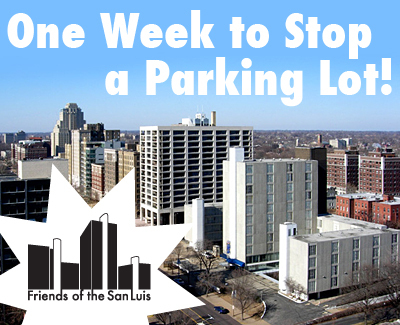 Today is the day you can show up to persuade the Board to deny this permit. It is especially important that we turn up in large numbers, because in some political corners they consider the permit a done deal. For all the latest information, visit No Parking Lot On Lindell. I am so happy to have run across this picture I took a couple of years before “Bob” spiffed up his sign. Oh, he respected the essence of it, so it’s still recognizable, and I’m glad he cared enough to invest some money in keeping the signage intact. Just glad to have a momento of it in the seedier days. 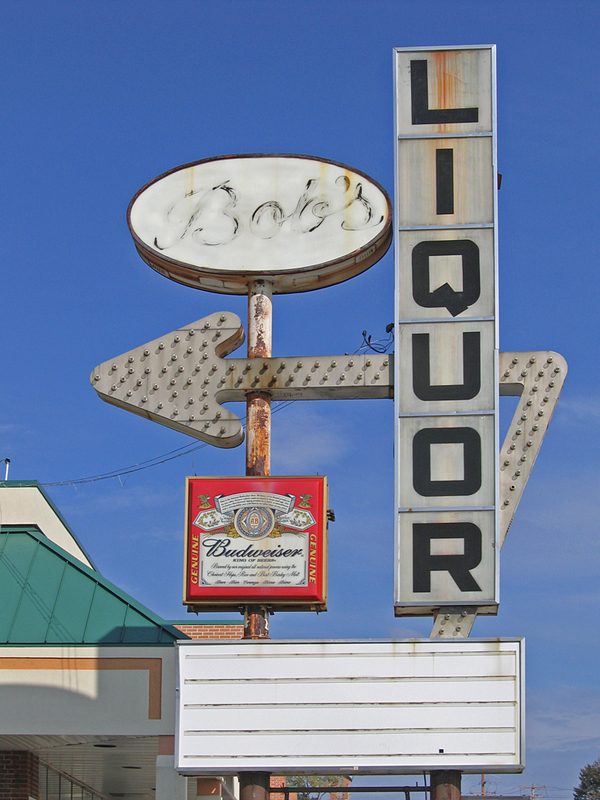 So, let’s test your liquor store knowledge…. where exactly is Bob’s Liquor? On Monday, June 22, a demolition permit for the San Luis goes up for review before the St. Louis Preservation Board. 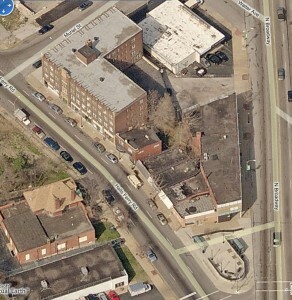 The owners want to demolish the building at Lindell & Taylor in the Central West End for a surface parking lot. If this doesn’t sit right with you, we need you to speak up. To assist you in speaking up on this matter, we have a form letter you can use to send to any of the people above. Cut and paste it verbatim, or use it as a starting point to express your own views. 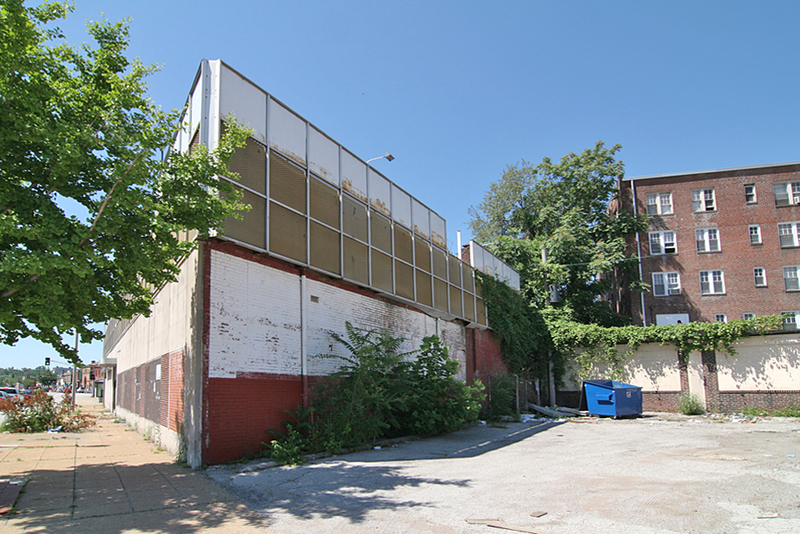 If you want the Preservation Board to deny a demolition permit, it is important to say so. 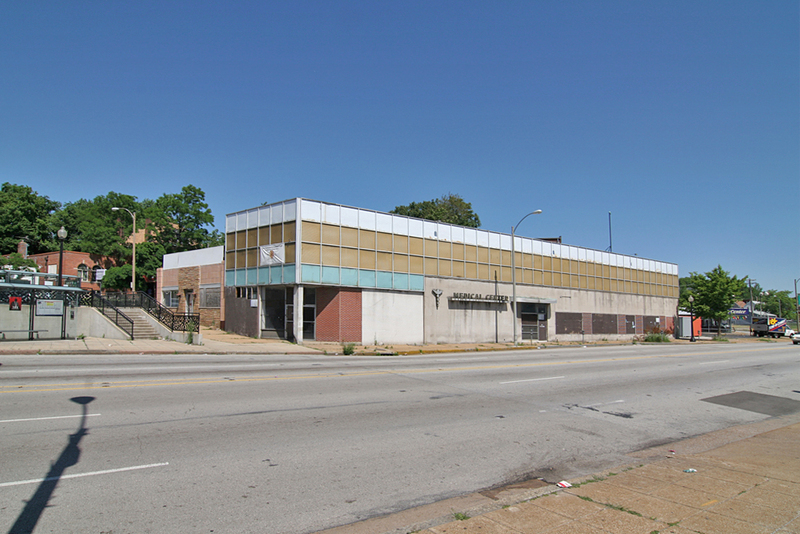 It is crucial that the Board and the owners of the building understand that this surface parking lot proposal negatively impacts the potential and the spirit of St. Louis City. 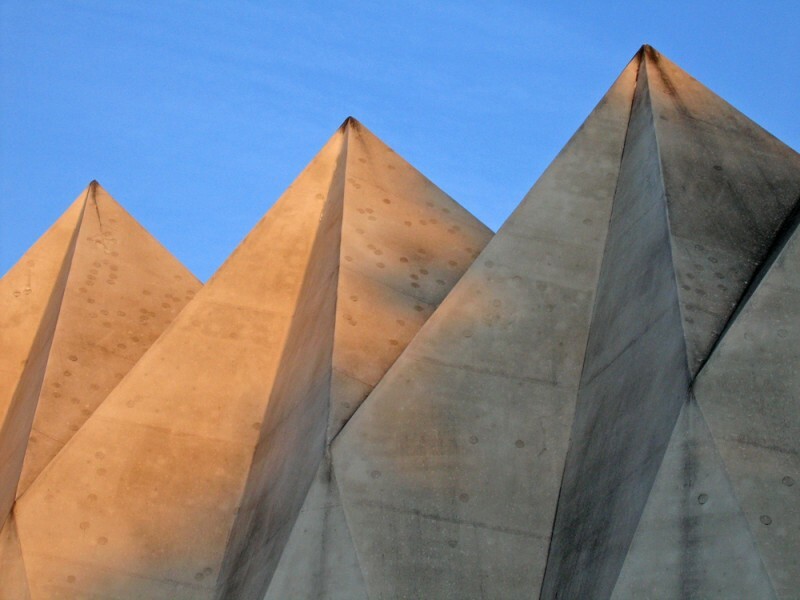 The abstract modern mountain peaks that make up the roof of this church are an iconic North County sight. Those of us who grew up in the Black Jack/Florissant area thought of them as a normal part of the landscape that became especially cool during the Christmas season. That’s when the peaks were alternately colored red and green by flood lights, and for a few summers, they even did red, white and blue for the 4th of July. If anyone has photos of that 1970s-80s holiday phenomenon, please please pass me a copy. UPDATE: As of Christmas 2017, those Christmas lights are back! And the roof has been gloriously restored. See here! 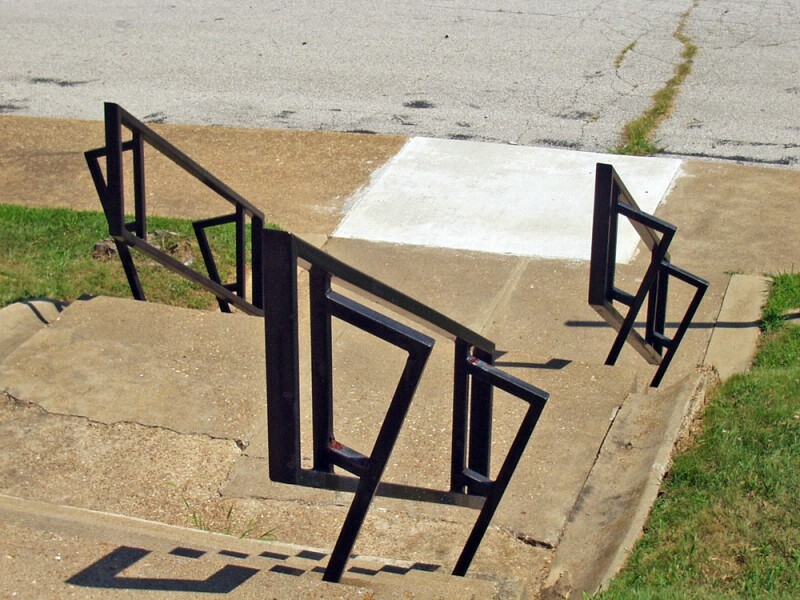 So, this was a normal part of the suburban landscape of North St. Louis County, Missouri, and I never thought of them as special until I saw this photo by Ken Konchel in 2000. It took the eyes of a superb architectural photographer to make me see just how special that roof was, and how unique the entire building was, in general. I’ve heard firsthand how many of us St. Louisans have had the same kind of awakening about The Arch; it’s always been there, yeah of course it’s cool, but then one day you see it in a detached, abstract manner and you realize what a glorious and unusual beauty it is. 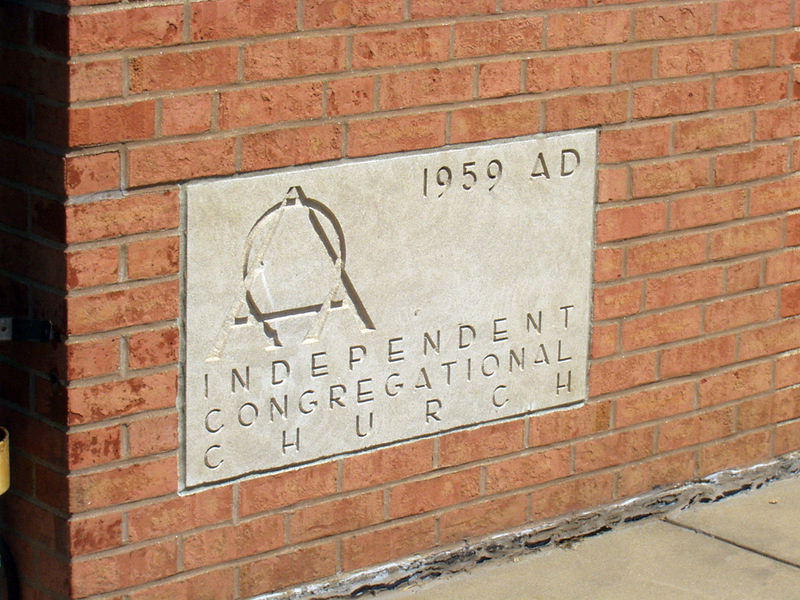 And so it was for me with the Independent Congregational Church. 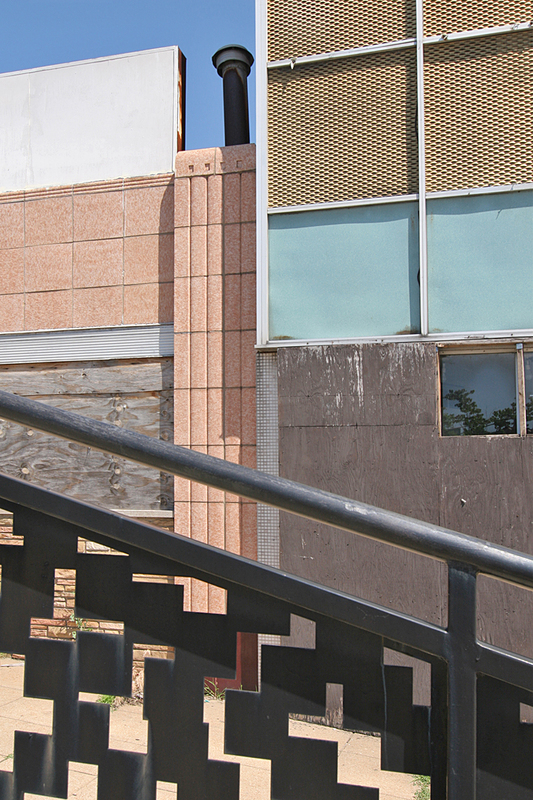 …like these slanting rectangle hand rails leading from the lower level parking lot on the south side of the building. 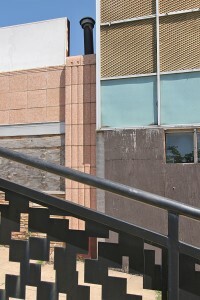 This is the 2-story rear of the building, as seen from the south parking lot. 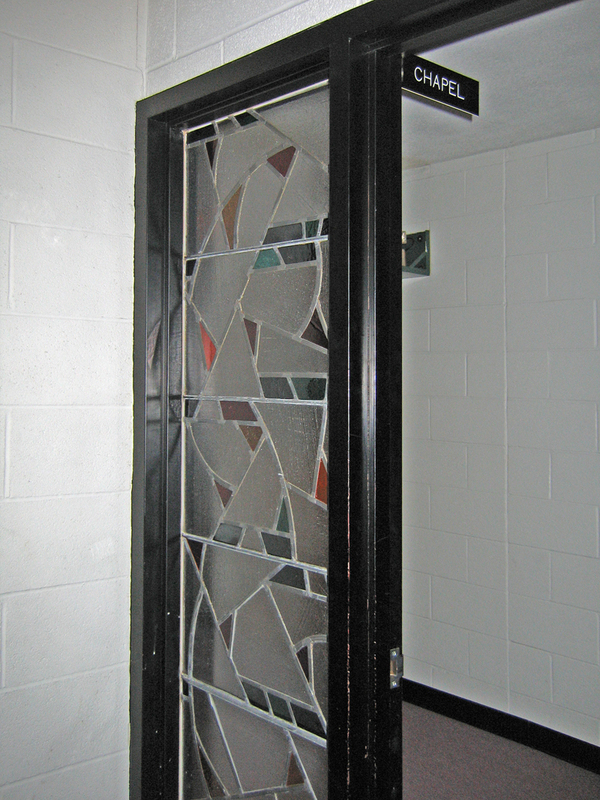 Upstairs is a small chapel and administrative offices with stained glass fenestration. 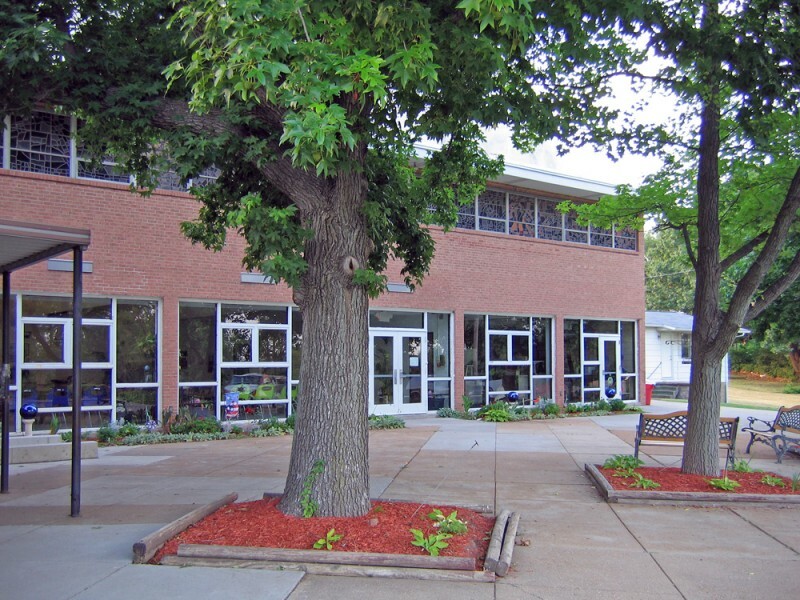 Below are light-filled classrooms and a small auditorium. It was in the summer of 2006 that I went inside the building for the first time. See more photos of that excursion here. 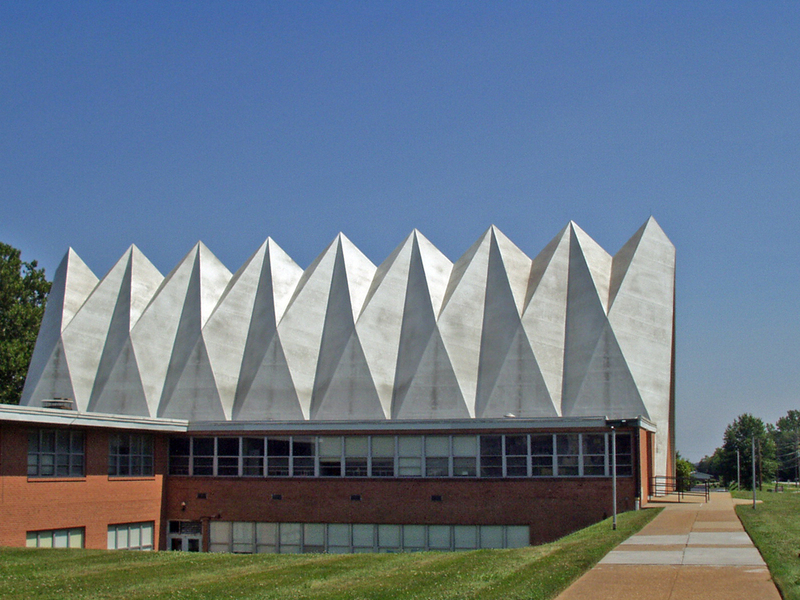 Once inside, the magnificence of the roof turned into awe over how the exterior structure dictated the interior. The holy, blinding white of the serrated exterior peaks transform into a wooden plank lining of unvarnished red wood, which lends this massive vertical space a reverent hush. 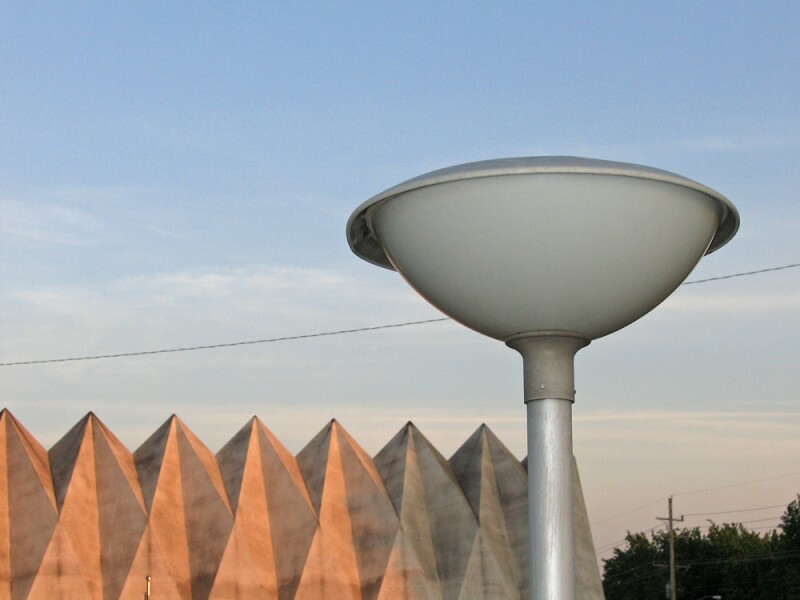 The cables suspending the metal can lights are a reverse echo of the triangles reaching toward the heavens. The sheer, upward lift of the space truly does inspire one to think lofty, spiritual thoughts, which is the point of ecclesiastical architecture. 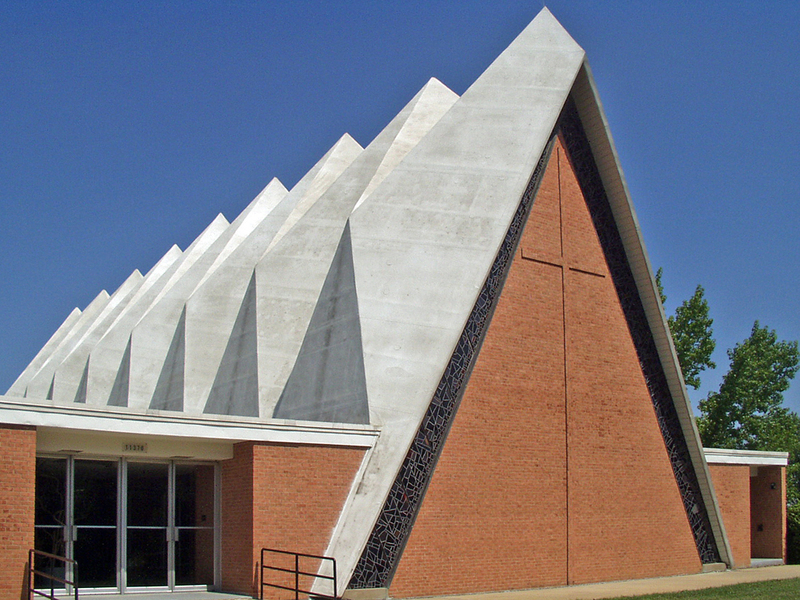 I have always been intrigued at how willing American religious parishes have always been to embrace the latest architectural styles and concepts. The other-worldy goals of religious enlightenment must make them more responsive to grand architectural gestures, and I’ve always loved how the spare lines and expansive geometry of modern architecture – rather than feeling alien to them – gave them a whole new vocabulary of expression. 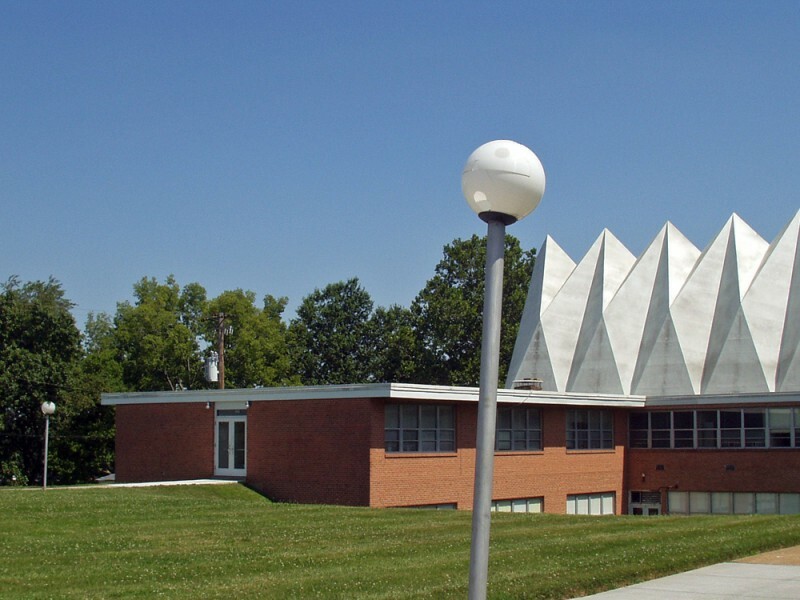 Quite often, it was a church that introduced modernism to a fledgling mid-century suburban community, setting a tone for the commercial and residential buildings around it. God bless ’em! 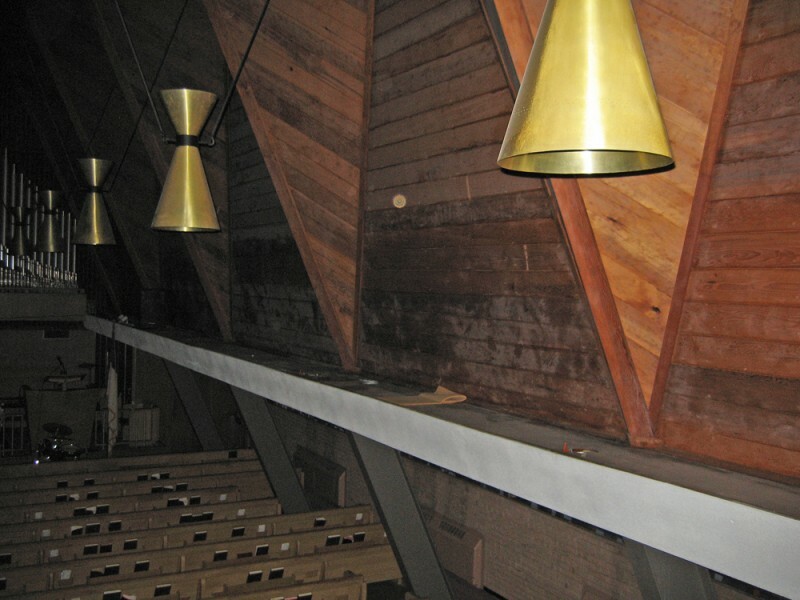 Blonde, Danish modern fixtures are carried throughout the lobby and auditorium of the church. 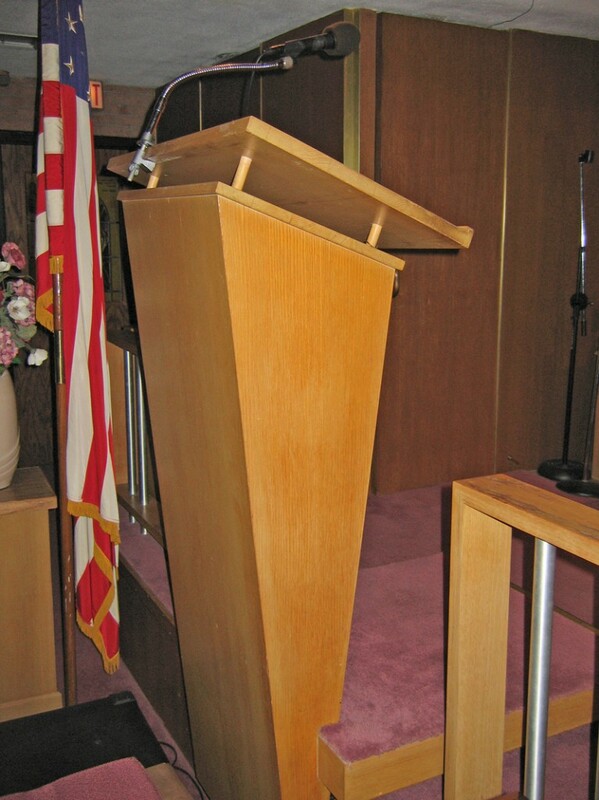 The angles of this podium on the alter are gravity-defying and maddeningly cool. 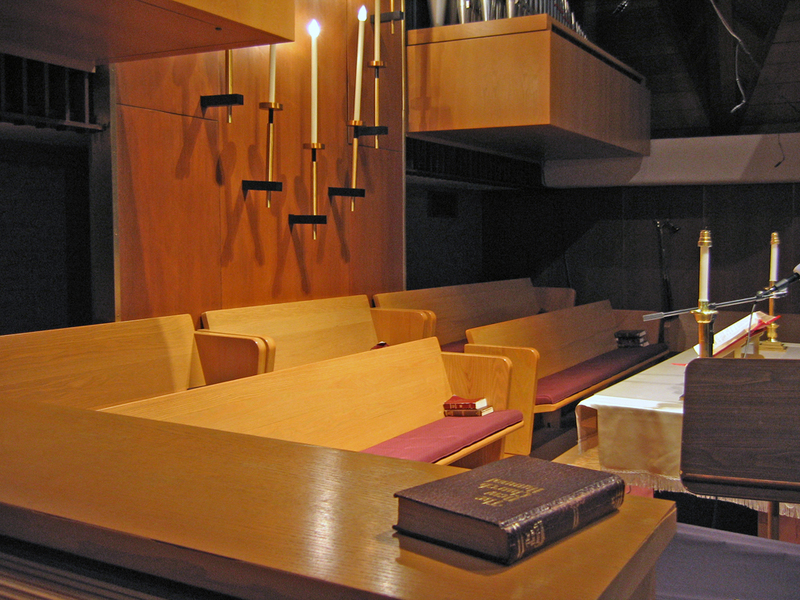 Here is a configuration of pews behind the main alter. To have those filled with white robes must be a breathtaking sight. …we come to the end of the picture-taking line, somewhere in the 1990s. 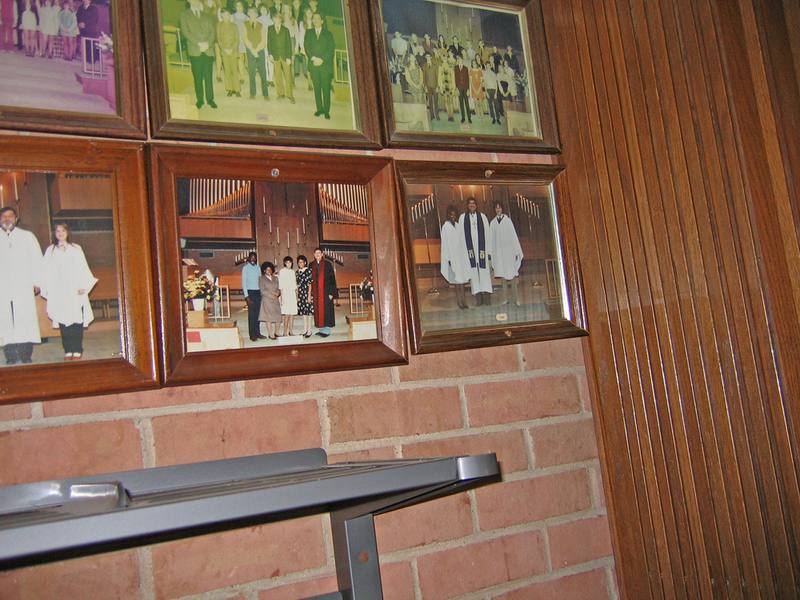 The pictures go from lily white to a mix of black and white folks, and it neatly tells the story of this church from inception to name change in 1998, when it became Christ The King Church. 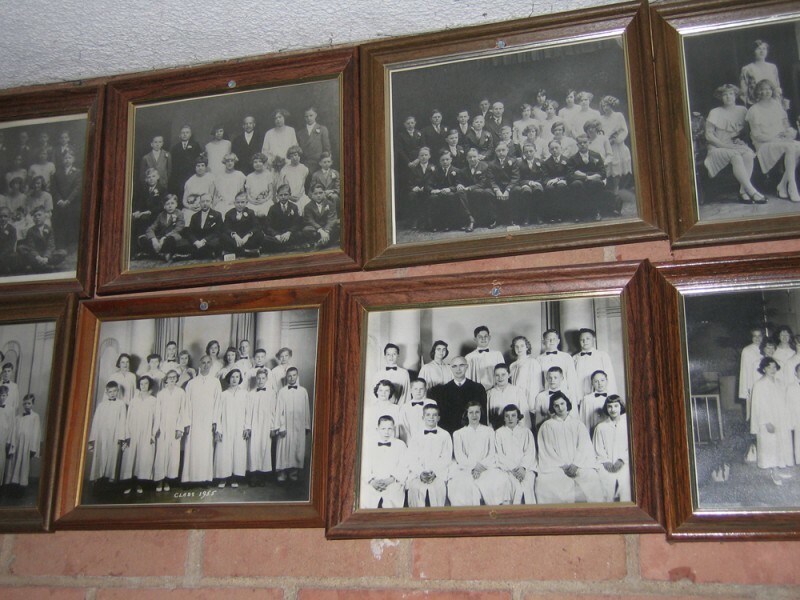 From its various locations to the changing flesh tones of the photos, one gets the distinct impression that this parish may have followed the St. Louis pattern of White Flight. My mother and I moved into Black Jack at the point in time when race became an issue for this community. But it was also the town where I first lived, played and went to school with non-white kids, and it did much to debunk the myths of prejudice I heard all around me. The current congregation is African-American, and pastor Andre D’Arden is the gentleman who let us roam freely through a building they are rightly proud to be in. I love that they have not changed much of the building, proving that a beautiful setting – no matter the vintage – allows the users to carry on their business with a sense of higher purpose. But there are some troubling aspects with the upkeep of this building. Above is a photo from 2003 documenting the last of the globe lightstands in the upper north parking lot. As can be seen from this shot, people were taking pot shots at the glass. The globe lightstands traded off with these “U.F.O. hat” lightstands. in 2009, all of them have finally bitten the dust, as well. And then there’s that roof. During the time I lived in the area, it was always a blinding white, and I assumed it was made of cast concrete. 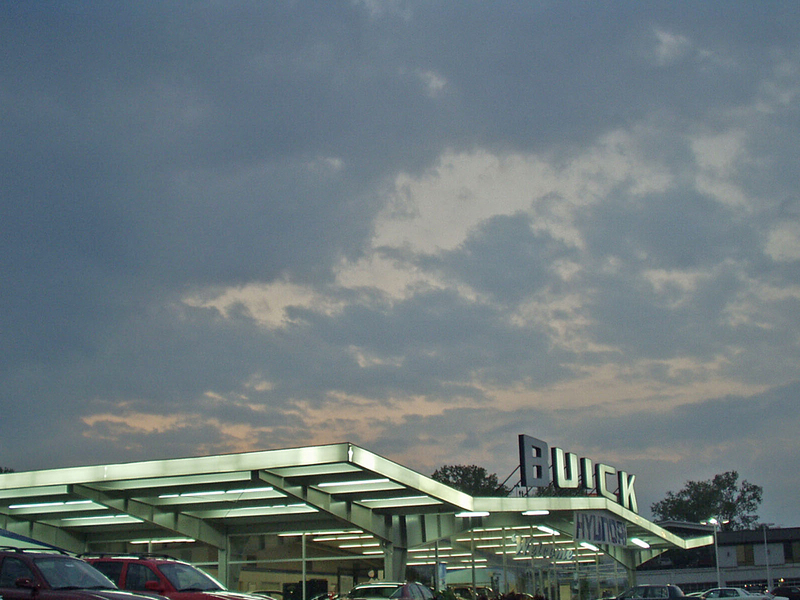 By 2006, normal wear and tear revealed circular plugs in the roof. Simply placing a hand on the portion of the roof that swoops down to the sidewalk revealed it’s not concrete, but a textured, rubber membrane. And a rubber membrane in great need of a new coat of paint. In the summer of 2006, I asked Pastor D’Arden about this. He noted the extensive construction work then going on to widen Old Halls Ferry Road, and that all of the dust and debris had really done a job on the roof. It wasn’t a good idea to tackle a re-paint of the roof until the construction was done, and that made complete sense. Contrast the above photo from May 2009 with the first photo of this entry (from 2003), and you can see the onset of a deterioration that placed this church on the St. Louis County list of Mid-Century Modern Architecture Worthy of Preservation. I can understand the garagantuan expense of materials and labor to prep and paint that roof being a deterrant. If you have limited funds, people would come before building. But maybe a special fundraiser and some volunteer painters? If they were to undertake such a project, I’d certainly donate money and would be first in line for a chance to scale that roof! 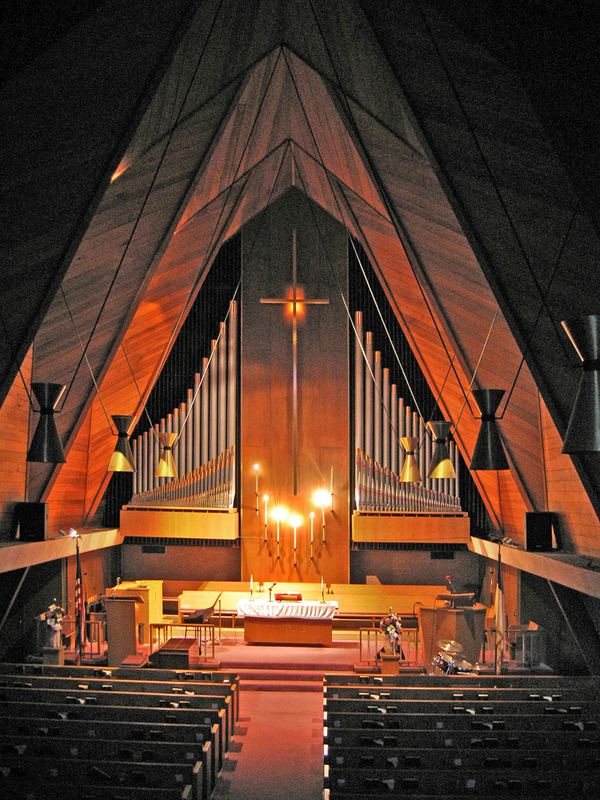 See more photos of the exterior and interior of this church here. 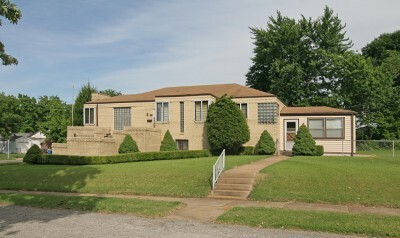 I took this photo in the town of Dellwood in North St. Louis County in the early fall of 2003. 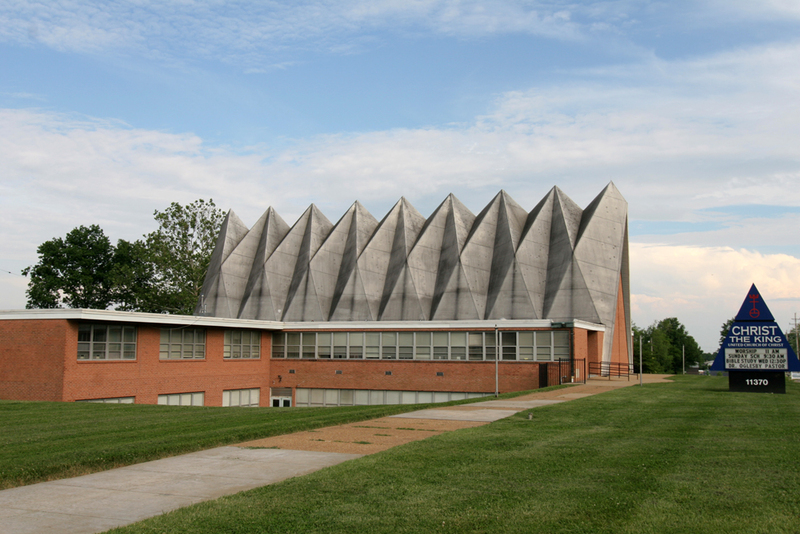 As a kid, I mentally referred to it as The Flying Building. I chanced upon it right as they turned on the lights, which made it look even more so like it was launching into flight. It was a quick moment, and I made mental note to come back and further explore this building with a camera. Upon returning for that purpose, it was clear the moment had passed. They had knocked down the original Buick sign and junked it up with a bunch more vinyl banners. But at least they haven’t torn down the building. Yep, I probably just jinxed it. Baden is the northernmost burg in St. Louis City, established in 1876. Because of its location as the terminus of major transportation lines, it became a popular gateway to North County. Or put another way, after World War 2, Baden was like training wheels for veteran city dwellers pedaling toward suburban living. 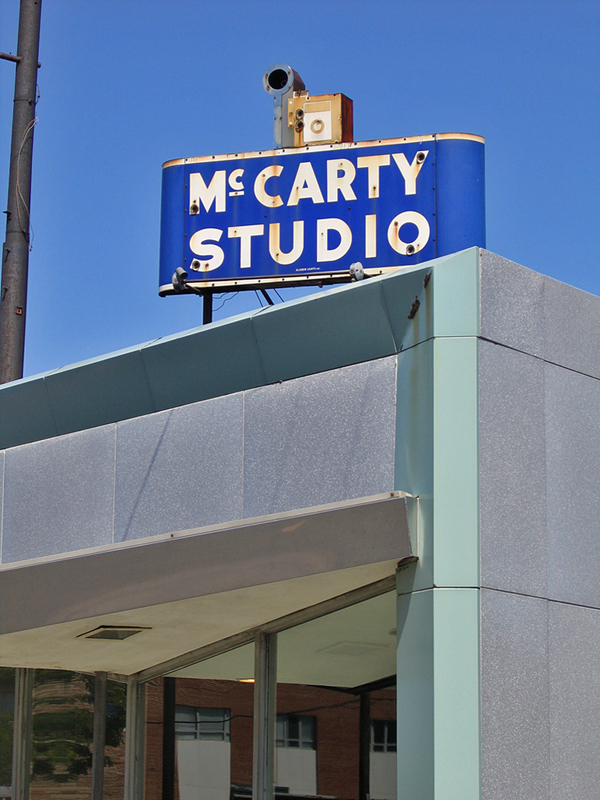 During the Great Suburban Exodus, the building shown below made an impressive effort to embrace the mid-century modern frontier by donning a sleek and colorful metal screen suit in the mid-1960s. The heart of the downtown Baden Business District straddles North Broadway and is still mostly intact, building-wise. It is easy to conjure how it worked and felt in the first half of the 20th century, and will be relatively easy to revive as America re-embraces the logic of density in the coming decades. 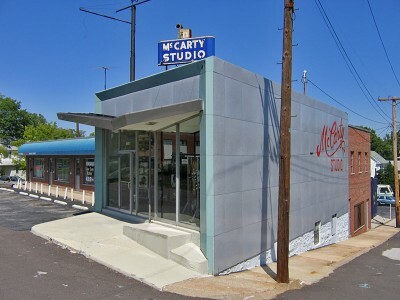 The Y intersection of Halls Ferry & N. Broadway – known as “The Wedge” by locals – was a bit more flexible at changing faces to keep up with the changing times. Driving up the hill on the Halls Ferry side is like time traveling through architectural styles, from newest to oldest. From the street, The Wedge looks and feels like one large scalene triangle of a building, but an aerial view reveals that 7 separate buildings make up this tableau (I’m excluding the white building on the northeast corner because it’s an unattached 1970 addition to The Wedge that looks and feels completely separate). By following the history of these buildings and its past occupants, you get a clear picture of the dominance (before WW2) and decline (post WW2) of the Baden Business District. 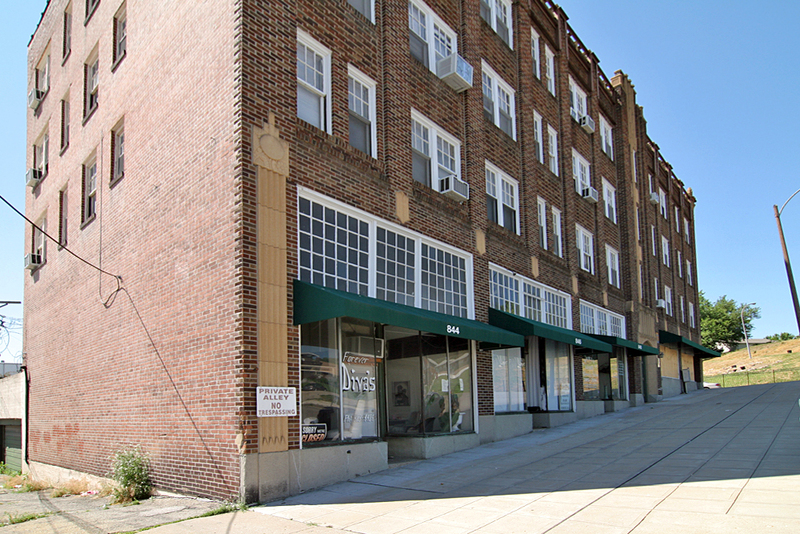 At the southwest tip of the triangle is 8312 Halls Ferry, built in 1925, which got a new Art Deco-ish face right around 1944 when Baumgartner Kummer Realty moved in. In 1948, it became strictly Paul Kummer Realty, and he stayed put until 1983. Note the display window; is this where he posted enticing pictures of the new modern ranches in North County? 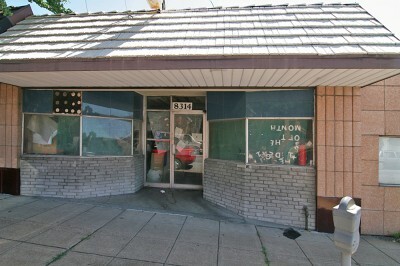 It has been vacant since 1986. Even though the next two buildings up the hill share the same pink fiberglass and burgundy Vitrolite tile as Kummer Realty, they are two separate buildings, both built in 1925, but obviously re-clad at the same time. 8314 Halls Ferry (above) has been home to John Flood, a paper hanging contractor (1932), Charles Schmidt Jewelers (1948-1960), Hartig Jewelers (1961- 65) and Baden Jewelry till 1968, when Paul Kummer Realty took it over. His business was obviously booming! 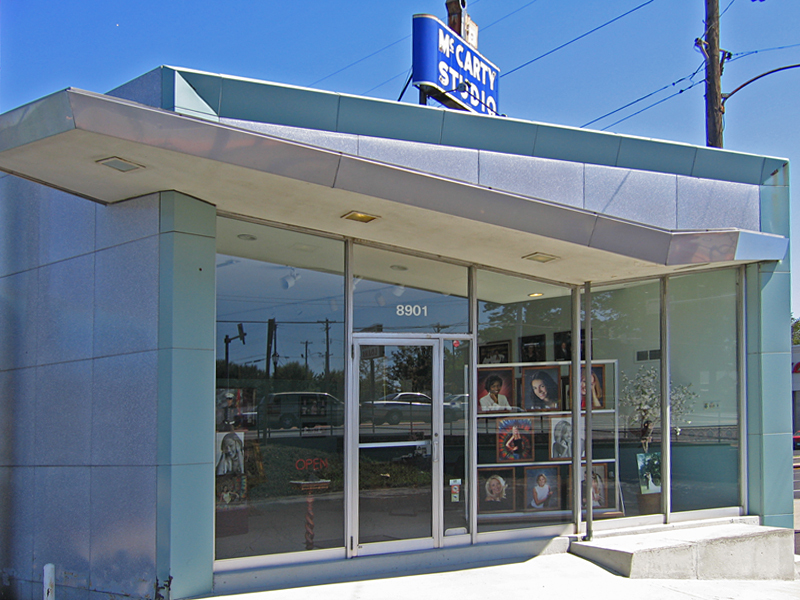 It sat vacant from 1977 till the early 1990s, when a couple of outlet stores moved in, but then left. It remains vacant. 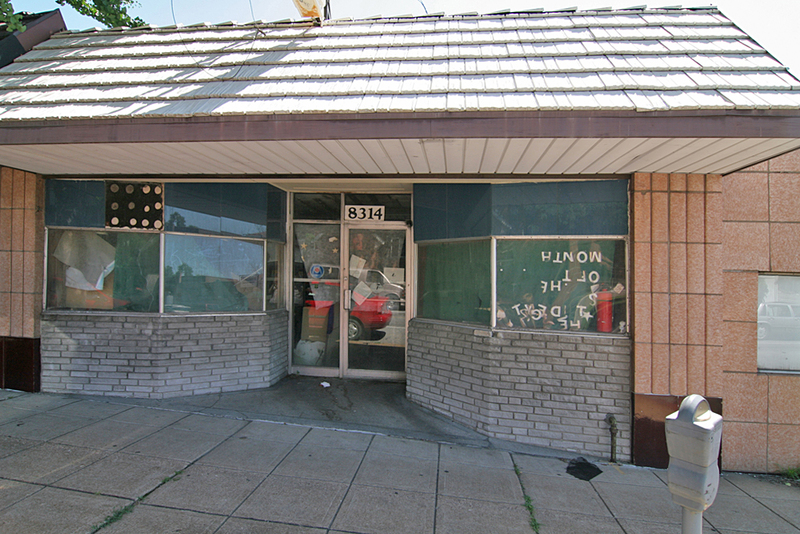 8318 Halls Ferry was Lungstras Dyeing & Cleaning Co. until it became Rockwood Cleaners in the late 1950s, then Hampton Cleaners & Laundry from 1961 till the building went vacant in 1966 and remained that way until a series of businesses came and went from 1999 till 2006. The space is currently vacant. The building at 8324 Halls Ferry went up in 1927 and started life as Louis Becherer Hardware. I’m supposing the the missing cladding on the ground floor was Vitrolite that went up when the space became Leyerle Jewelry Co. from 1941 – 1983 (getting the impression that Baden was the place to buy jewelry?). The upstairs was an optometrists office for a bit of the 1930s before it converted over to residential rental. Since 1992, nothing much has gone on with either floor of the building, other than being stripped of its pretties. 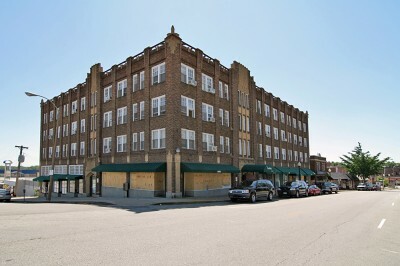 We move up the hill to the L-shaped Ludwig Building, an impressive 4-story affair built in 1929 in the classic urban tradition of retail on the ground floor and apartments above (43 total). 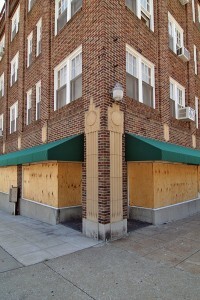 Most everything about this building has remained virtually unchanged, which may account for its current sad state. More on that in a second. Storefront 8332 (shown above) started life as Baden Delicatessen and then became Howard’s Cleaners from 1941 to 1958 (how many cleaners did they need in one block?). 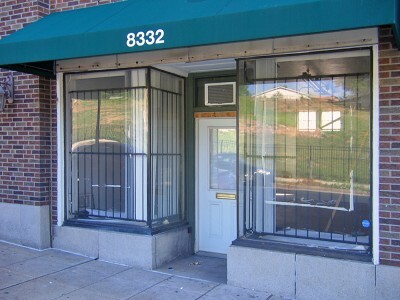 From 1958 – 1990 it became a part of LeRose Flower Shop at 8330 Halls Ferry, and then converted back to single occupancy for Miss Connie’s Fashions and Matthews Realty & Investment. It has been vacant for most of the 2000s. 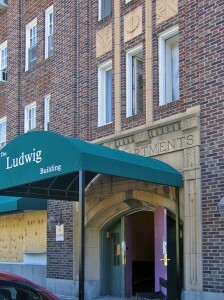 Here is the only entrance to the Ludwig Apartments that remained open in summer 2008, and at that time, there were occupants. 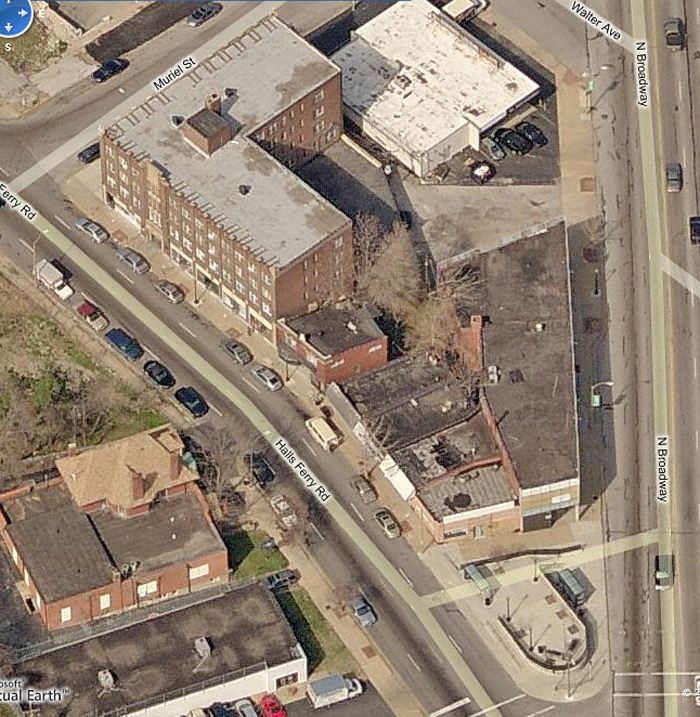 Here’s the overall corner view of the Ludwig Building, showing how grandly it occupies the summit of The Wedge. Note window A/C units in some of the windows and know that the apartments have never been updated. 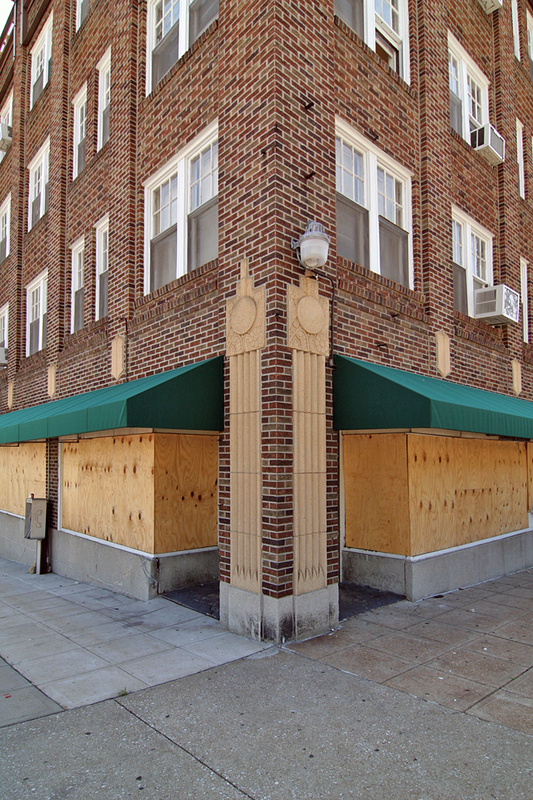 At the end of 2008, all remaining residents were evicted, new owners bought the place for a song in early 2009, and now every entrance and storefront is boarded up. From street view, the building is still remarkably intact, and I’m picturing a brave and adventurous developer knocking down partition walls to make larger apartments or even loft condos. 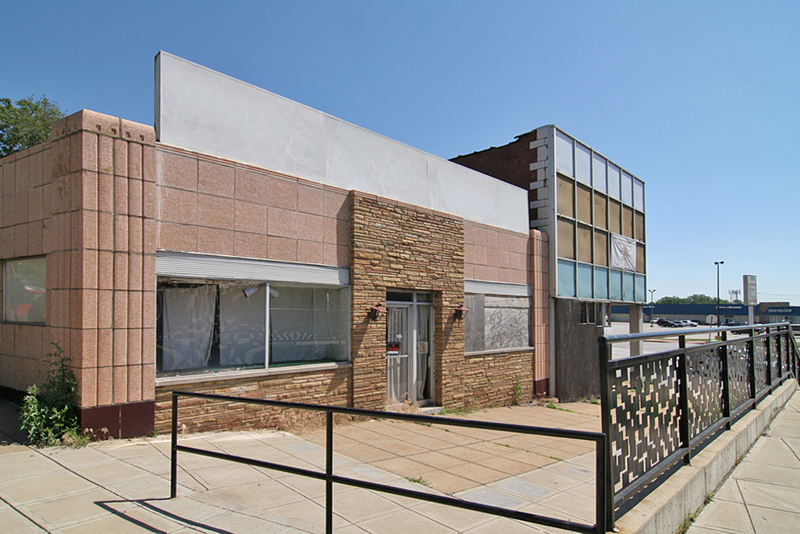 The potential for this building is huge, as it is for everything in The Wedge. 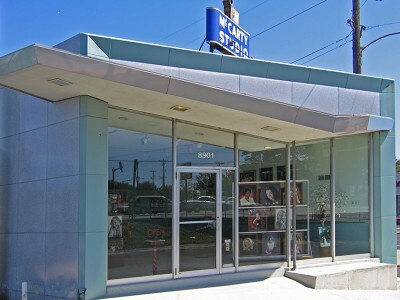 The corner storefront of the Ludwig Building was a Velvet Freeze ice cream parlor from 1941 – 1999, and that is as it should be for such a great location. 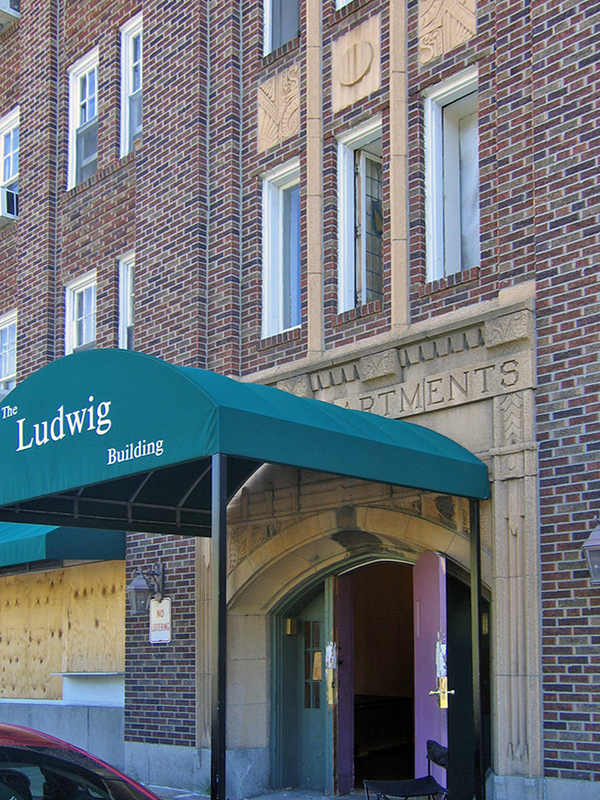 This is the Muriel Street side of the Ludwig, and note that – somehow – the original transom glass has survived over all these storefronts! 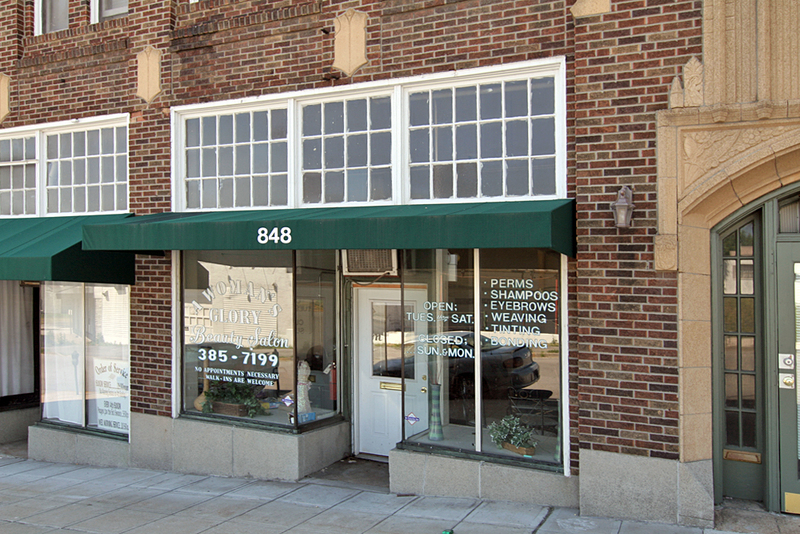 Attorney Edward Rothganger had an office at 848 Muriel from 1938 – 58, at which point The Baden News Press (yes, the town had its own newspaper until 1977!) expanded into this spot. And we head down Muriel to North Broadway, where we return to the building that started our tour – The Medical Center. 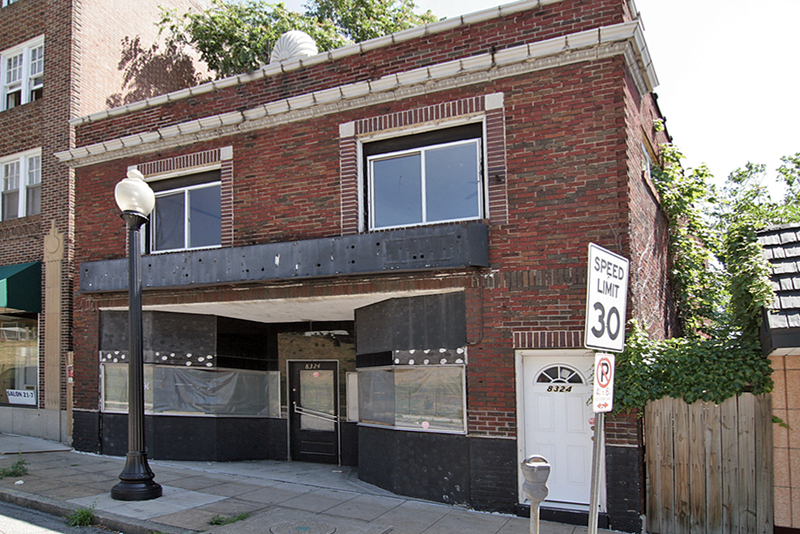 This 2-story brick building went up around 1925, and the place got a new face right around 1966 (see how the metal screen fastened to the brick). 8315 is the portion of this building at the tip of the wedge, which originally housed the Baden Building & Finance Corporation upstairs and Herman Ludwig Drugs at street level. 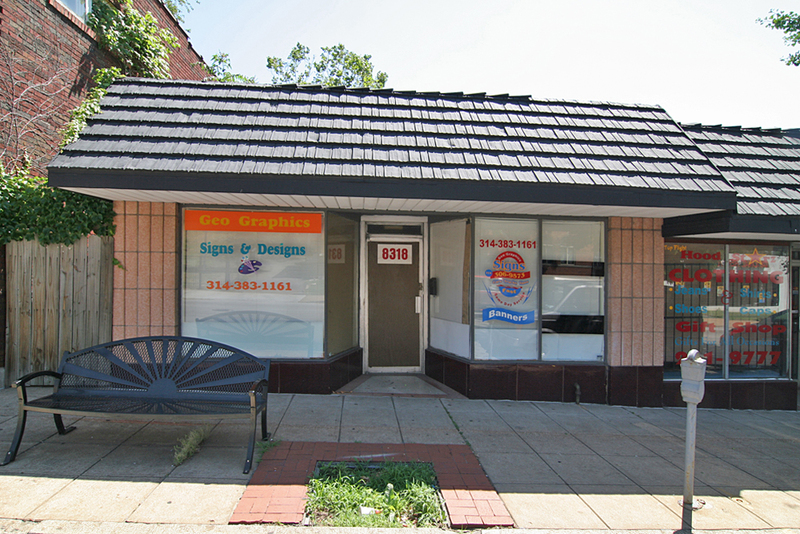 In 1941, Boesel’s Royal Drugs took over the space until closing up shop in 1983. A Dollar Store and a beauty supply went in during the 1980s and 90s, but the entire building has been vacant since the City took it over in 1999. Here we have the Baden Medical Center proper, so known by the fabulous stainless signage that remains in place to this day. 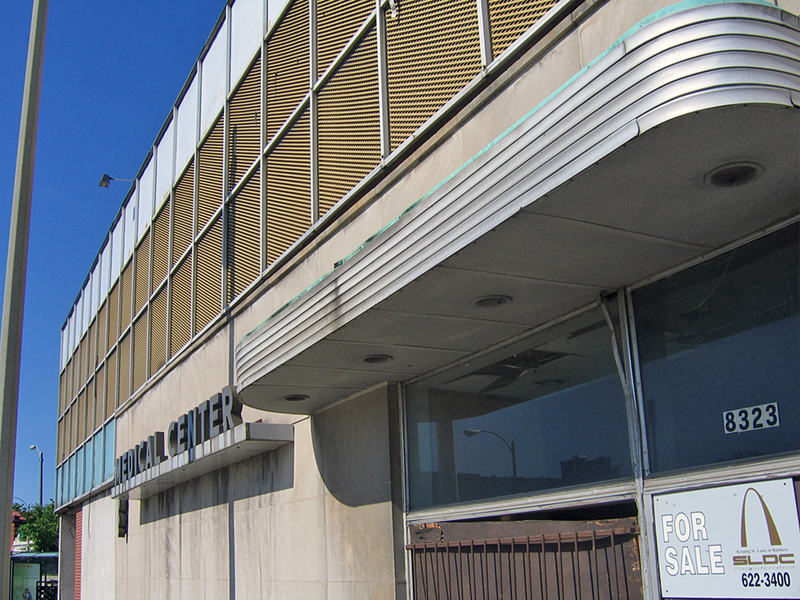 In 1966, 7 doctors had practices inside, dwindling down to 4 by 1973, and one doctor and one attorney by 1986. 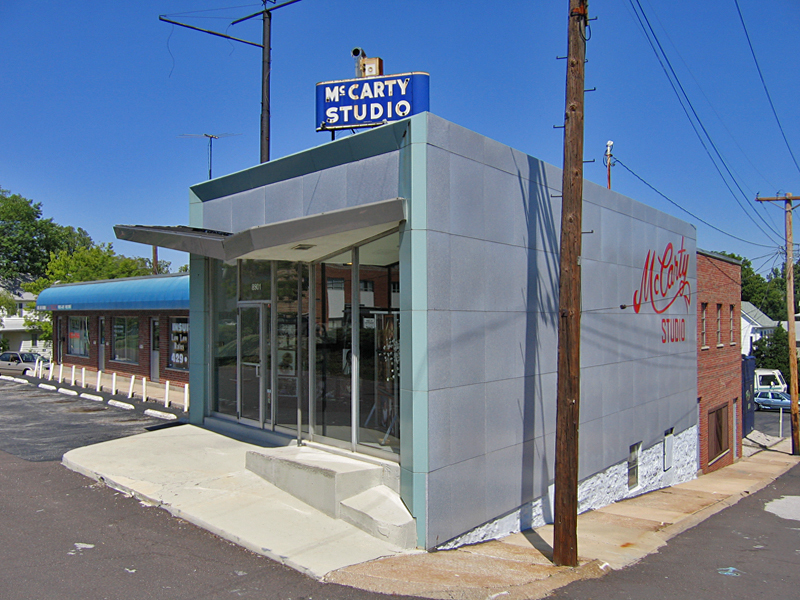 In the early 2000s, the City spent quite a bit of money to build a spiffy, multi-level bus stop at the tip of The Wedge, which also signaled that these buildings were ripe for redevelopment. But the bus stop is now overgrown and littered, and the For Sale signs on the Medical Center are a little moldy. But as long as they don’t tear them down, hope remains. See more photos of The Baden Triangle here. 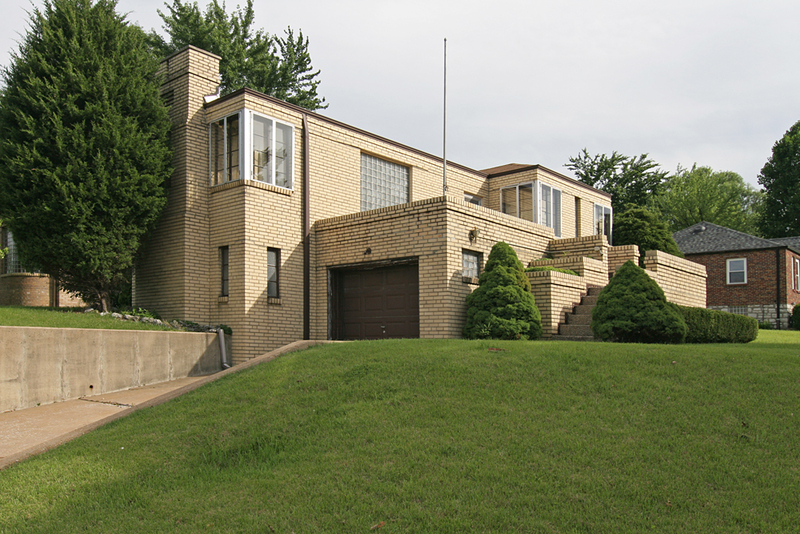 This was the Future: Mid-Century Modern Architecture on Lindell Blvd. Have a mid-century modern morning in May! A screening of the new short documentary San Luis: This Was the Future tells the story of the threatened San Luis Apartments. 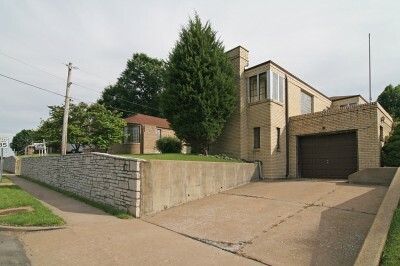 After the 10 minute film, Toby Weiss of beltstl.com and Michael Allen (ecology of absence) will lead a walking tour of the many mid-century treasurers along Lindell Boulevard, where modern design flourished between World War II and the 1970s. The walk will run from the Chase Park Plaza Hotel to Vandeventer and back, so be prepared for serious walking. See a free movie, take a free tour, get a little exercise, get a lot of knowledge… there are worse ways to spend a Sunday morning! Please do join us Sunday if you can. Michael is the brains of the outfit, I’ll be the “little song, little dance, a little seltzer down the pants.” It promises to be a good time.